The ‘play a card’ buttons will now be disabled if you have already played one. This is indicated by the grey borders in the image. 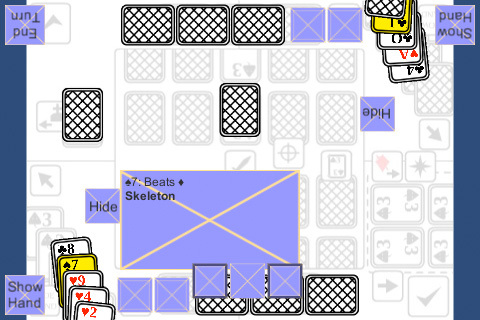 In the screenshot, it is currently the top player’s turn (indicated by the ‘end turn’ button in the top left) so the bottom player can’t play their cards. This also updates after playing a card yourself. What’s next: some more self-playing testing is probably needed. There is also currently an issue, where all cards drawn from the deck are face down (so your opponent can’t see them). The problem is that even if you have your hand shown, it’s still hidden, which looks weird. I’d like to get this issue fixed next week. Also there’s still a ‘play a card’ button in the middle that’s enabled. I need to disable it for certain cards.